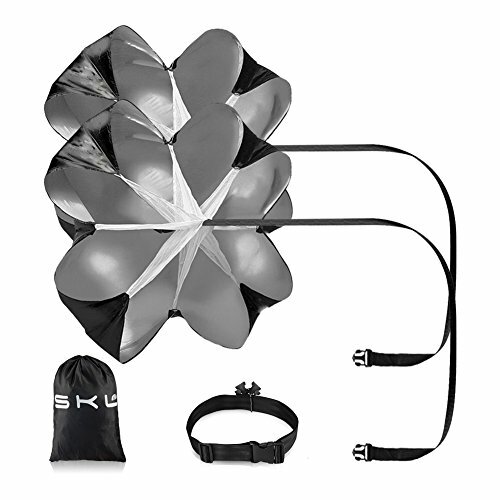 SKL Running Umbrella, Upgraded Version 2.0, we upgraded the belt design and added a umbrella in November 2017.
and be free to contact us if still have any question. TWO Umbrellas - This speed training resistance umbrella include 2 umbrellas, is light weight and with a bag, easy to carry it outdoors for training. PERFECT SIZE - Explosive Power Training Chute, Diameter: Approx 56 Inch / 142.2 CM, can provide 18-35 lbs (2 umbrella) of resistance. ADJUSTABLE BELT - This resistance parachute is with adjustable waist sizes 20-42 inches, the belt can rotate 360 degrees and you can sprint in any direction. HIGH QUALITY - Made from high quality parachute cloth & netting, built-in mesh panels keep strings from tangling and helps stabilize the chute during training. MULTI FUNCTION - Resistance parachute is very popular in sport training. It can be widely used in training track and field, running ball games, cycling, skating and other projects, helps increase explosive power, speed and core strength. If you have any questions about this product by S.K.L, contact us by completing and submitting the form below. If you are looking for a specif part number, please include it with your message.